Lunch at Debenhams is always on the program when we are in London. 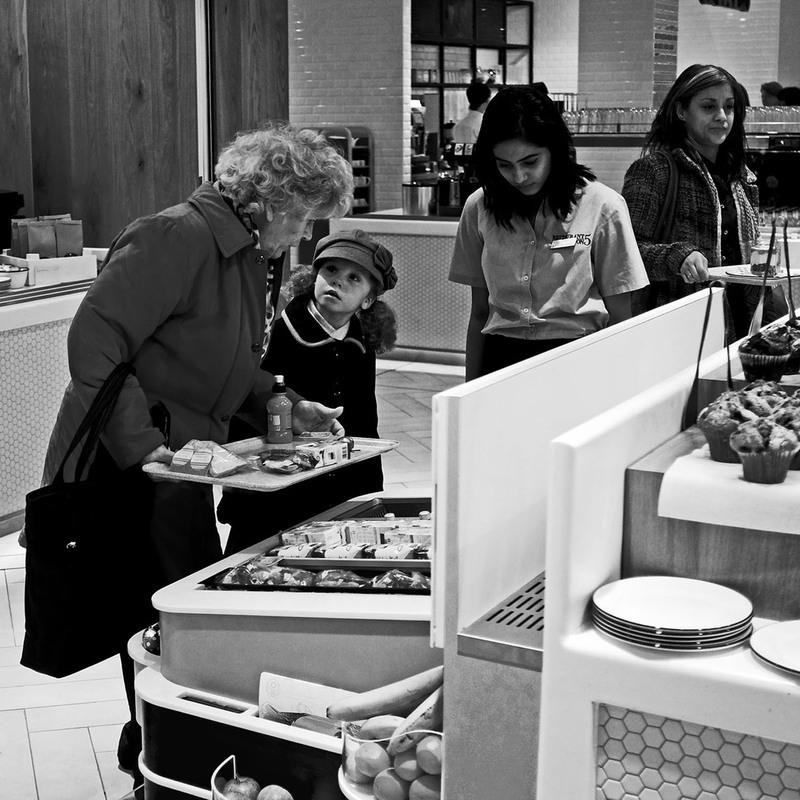 Debenhams serve a reasonably priced meal and we enjoy watching the many different people eating there. These two caught my eye as they were discussing the possible choices. In the middle of the many institutes and buildings that makes up University of London is Gordon Square. Tables and chairs are scattered across the square. The busy traffic on Byng Place flows past with little visible demarcation between it and the tables. It gives the impression of the tables standing in the middle of the street. 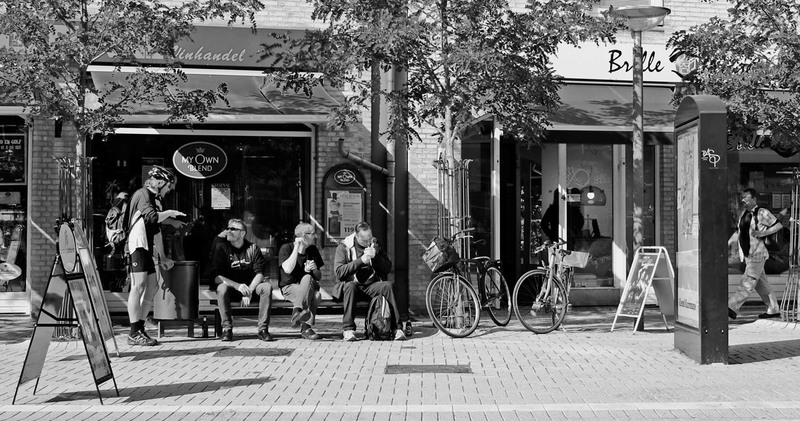 This lady seemed unperturbed as she sat enjoying her coffee. I tried to chat her up, but she wasn’t very talkative. Perhaps because my wife was with me. 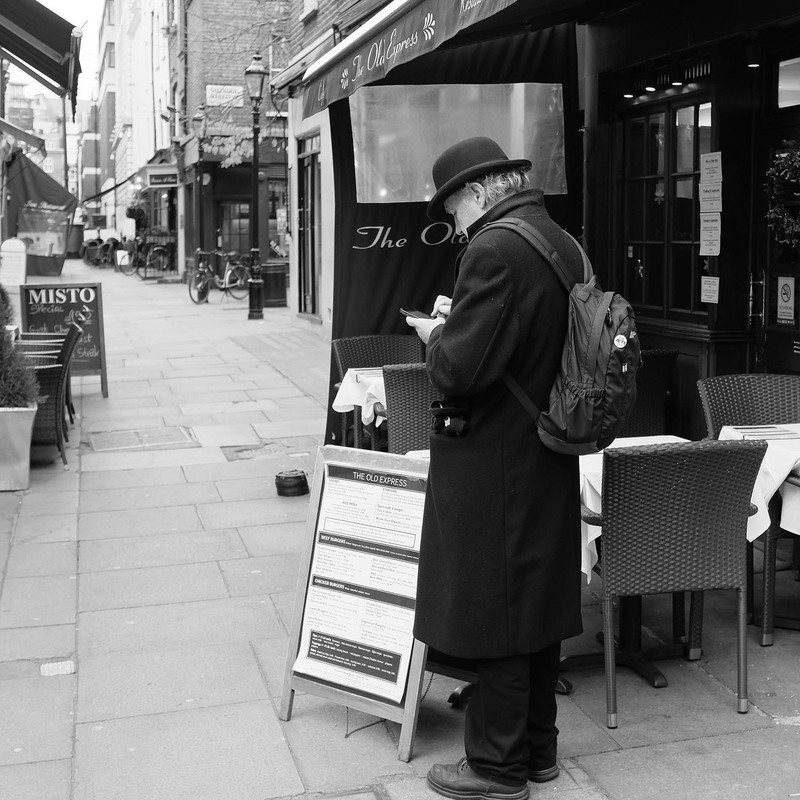 We had explored Shepherd Market and were on our way into a nice looking Pub, when I saw this enigmatic looking gent, dressed in classical long dark coat and bowler, but in stout walking shoes and toting a rucksack. I have the feeling that he was consulting a map on his smartphone. What can be better than a chat with good friends. 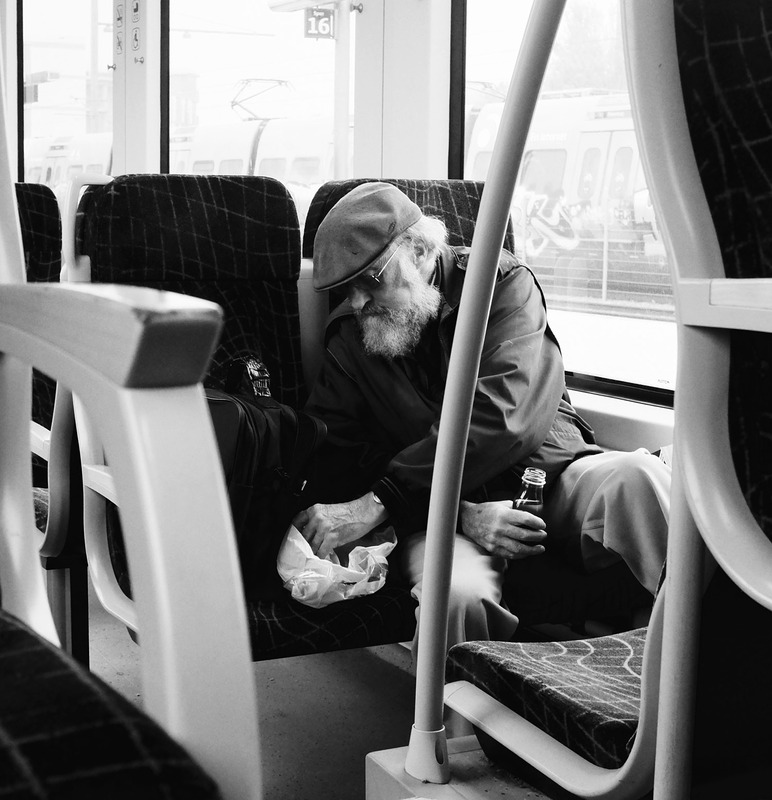 We were travelling north to Kronborg Castle on a photo trip and had just boarded the little local train, when this gent came in and sat down on a seat across from us. He got himself settled and began to eat his lunch. When finished he fastidiously folded the sandwich paper and packed that and his cold drink bottle back into his rucksack. The rest of the trip he spent enjoying the passing countryside. Now that I am looking for it, I notice more people reading papers instead of hanging on their eternal smartphones. 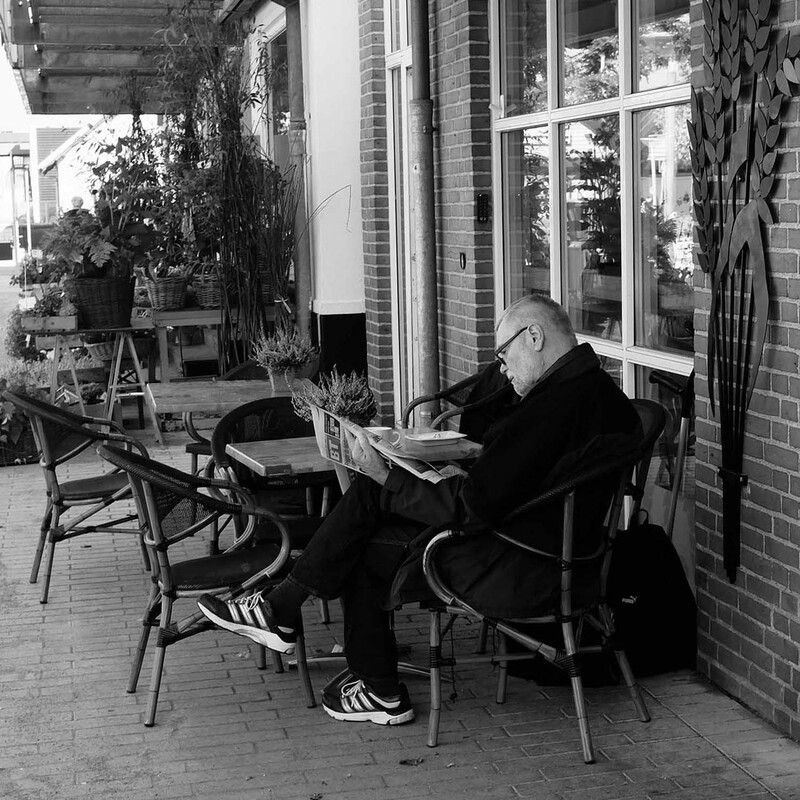 This chap was sitting with his coffee at one of the few outside Cafe tables in our local walking street. He looked very concentrated. 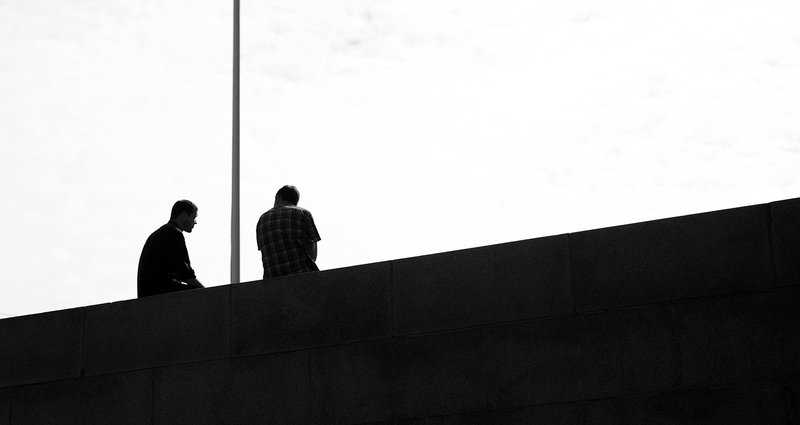 It was early this year on a cool spring morning, that I came across these two sitting on a wall close to the old stock exchange in Copenhagen. I realise, that there is only one pole in the picture, but I still felt like playing on words. 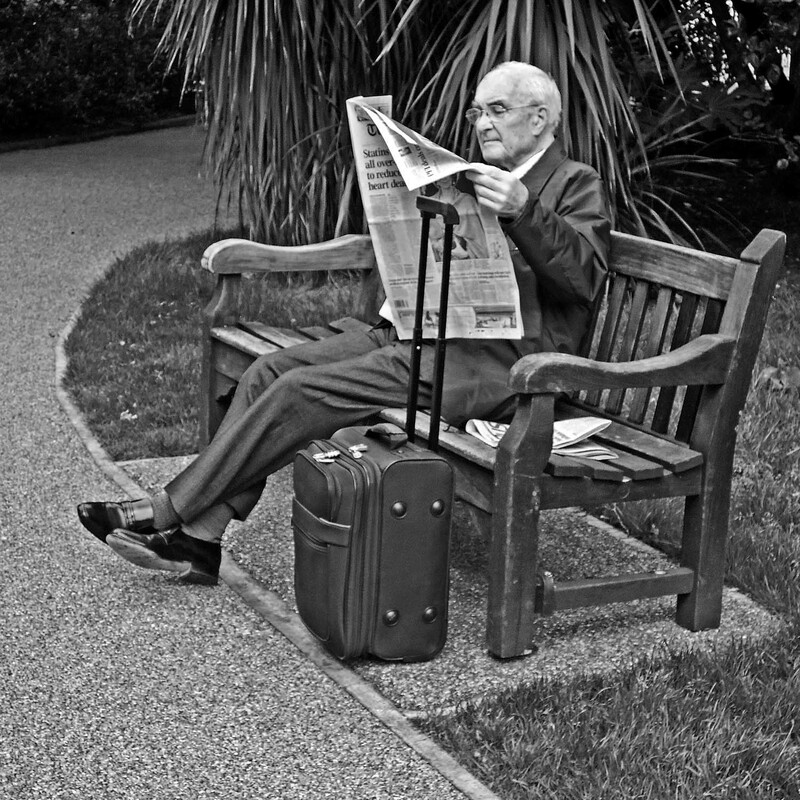 In these hectic digital times this gent sitting contentedly on a London park bench reading his paper was a rare sight. A good old fashioned newspaper is a wonderful thing. It needs no recharging or system updates. It can be read in bright sunshine and from all angles. The content is secure and can only be shared by personal contact. When a new model comes on the market, the old one can be used for wrapping chips and fish in, it can be rolled up for swatting flies or crumpled for starting a fire. For those who have a vested interest in newspapers remember this. Tomorrow’s garbage gets wrapped in today’s paper. You need never lose your way in London. There is always a helpful local at hand. We have even at times stood looking bemused studying our map, when some kind soul has approached us asking if he could help. 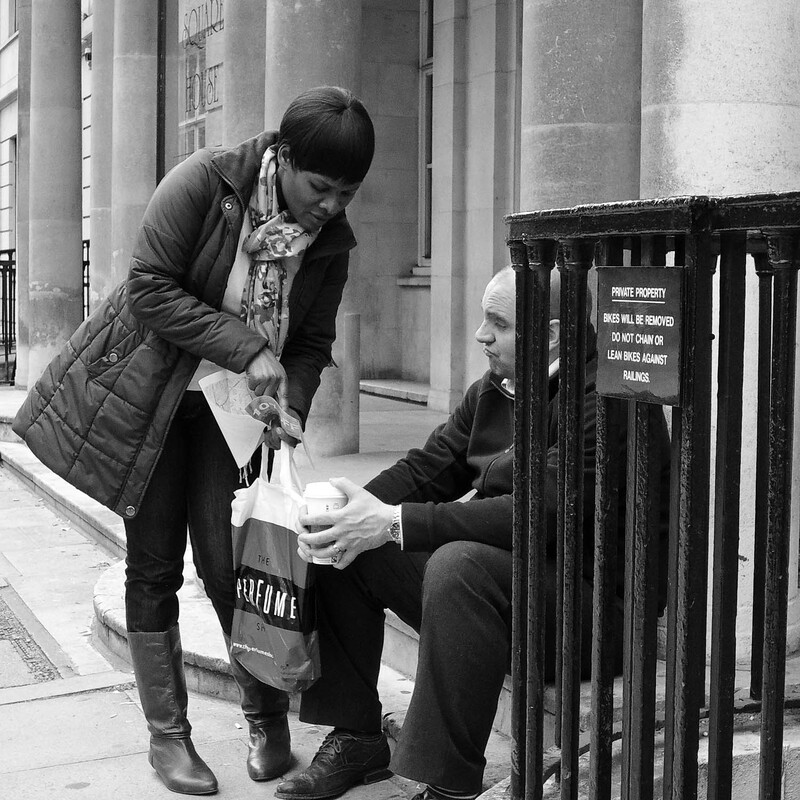 London is full of nice and courteous people.